Our certified iridologist (Rana El-rass), will read your irises and send you a 2-page report summarizing your body’s imbalances, along with a customized herbal protocol. What is Iris Reading (Iridology)? Iridology is a tool used to obtain information about a person’s overall health. Various markings in the iris (the coloured part of the eye), such as the colour and structure of the fibres, provide information about the health of every organ and system in the body. Each area in the body is mapped into a corresponding area in the iris (see Iridology Chart below). Iridology does not diagnose and/or name any diseases, but can reveal the presence of inflammation and degeneration in the body. The eyes transmit information to the nervous system, which controls every tissue in the body. Likewise, the eyes receive messages through the nervous system from every tissue in the body. These messages are manifested in colour and structural changes in the iris. How to Take Iris Photos? It is best to have 3 people take the photo in a room with no windows. You open your eye very wide with your fingers. The second person directs a flash light on the iris from the side at an angle. The third person takes the photo with a good quality mobile camera with the flash off (best to use Samsung or iPhone4+). Remember to label the photo as right or left. Do the same for the second eye. When to do Follow-up Iris Readings? 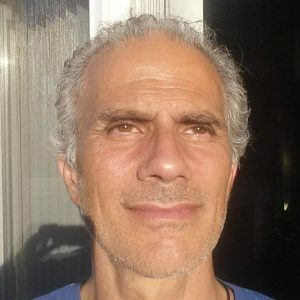 Readings are best spaced at least 6-months apart on MFS Lifestyle of Less is More to allow changes in the iris to take place as the body heals itself. 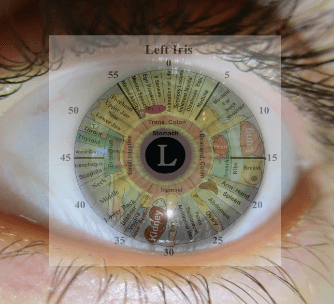 An iridology chart shows the correlating areas of the right and left irises, as seen in the mirror. The right iris reflects the right side of the body and the left iris reflects the left side. There are no cures, treatments, and/or diagnoses here. Please read the NOTICE. Contact Us to request Rana El-rass‘s email so you can send her your iris photos. Rana El-rass will read your irises and send you the report within 1 week after submitting your photos.